The process of developing and executing an influencer marketing campaign can be daunting. Especially if you’re new to it or if you don’t have a dedicated team to handle the campaign. You may end up working with the wrong influencers and struggling to engage them. You might even plan campaigns that don’t really suit your goals or overspend on unnecessary aspects of the campaign. That’s where influencer marketing agencies come in. Through these agencies, your brand or business will finally be able to carry out a well-planned influencer marketing campaign that fulfills your goals. They will take charge and handle everything from the planning process to influencer recruitment and campaign monitoring. So influencer marketing agencies really help you save time and effort while ensuring that your budget goes where it’s supposed to. Viral Nation is one of the top influencer marketing agencies in the world, and doubles up as a talent agency for influencers. They have worked with top brands such as Apple, Crayola, Tencent Games, and more. Their offices are located in New York and Toronto, but they work globally for brands all over the world. The agency has even won several awards and accolades for their contributions to the influencer marketing landscape. They won gold and platinum at the 2019 AVA Digital Awards. 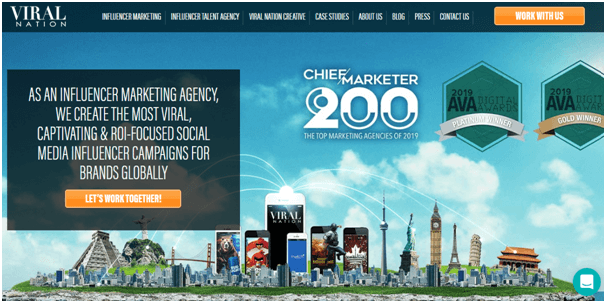 And they have even been recognized by Chief Marketer as one of the top 200 marketing agencies of 2019. Viral Nation represents influencers and helps them land brand partnerships. They provide them with legal services and negotiate fair compensation on their behalf. So they have a ready reserve of potential influencers for the brands they work with. It becomes much easier for them to match up brands and influencers that can mutually benefit each other. They help brands execute influencer marketing campaigns across various social media channels. The agency will handle everything from campaign planning to influencer selection. They also have powerful analytics to help brands keep track of how much impact their campaigns are delivering. You may have already heard of Mediakix. Not only are they one of the best influencer marketing agencies in the world, they are among the top producers of influencer marketing content. Their offices are located in California, but they work globally. Mediakix is the agency behind the success of famous influencer marketing campaigns from brands like Blue Apron, Birchbox, BarkBox, Nordstrom, and more. They help brands develop influencer marketing strategies and arrange campaigns that involve prominent bloggers, influential YouTubers, and famous social media personalities. They can help you run campaigns across all the top channels including YouTube, Instagram, Snapchat, and Facebook. 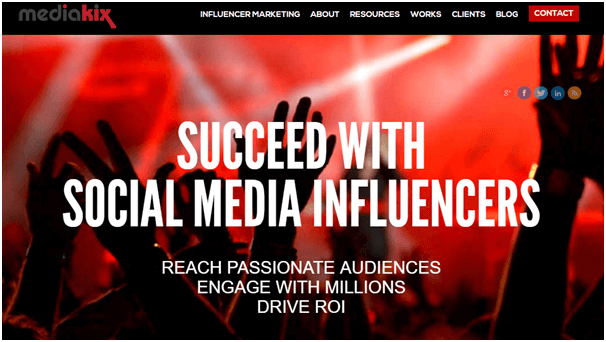 HireInfluence is a full-service influencer marketing agency that has been in the industry since 2011. So they are true veterans in the influencer marketing space and have become a go-to partner for Fortune 1000 brands. Their offices are located in New York, Los Angeles, and Houston but their services are available to global brands. In fact, they have worked with thousands of elite influencers from 12 countries and across multiple industries. HireInfluence has an extensive client roster comprising of brands like Adidas, DC Comics, Arby’s, eBay, Burger King, Gatorade, Barnes and Noble, and more. So you can see that they have executed influencer marketing campaigns across all verticals. Their services are fully customized according to the needs and objectives of each client. In addition to assisting you with every step of your campaigns, they will also train you so you can get better at influencer marketing. This makes HireInfluence one of the best influencer marketing agencies that you can find. HelloSociety is another veteran in the influencer marketing space and has been around since 2011. In 2016, they were acquired by The New York Times and have continued to help brands engage top-of-the-line influencers and content creators for their campaigns. The agency puts human connections first, and calls themselves a “full-service social storytelling agency” in which influencers tell brand stories. And their focus on storytelling seems to pay off, according to their internal analysis. Their campaigns deliver an average engagement rate that’s 54% higher than the industry average. 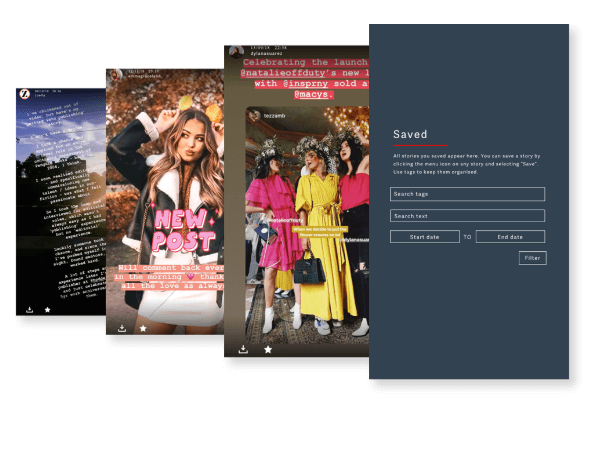 For influencers, their average engagement rate on the content they create with HelloSociety is 25% higher than on their other sponsored posts. Their influencers even deliver a 24% higher engagement rate than regular brand content on social media. Based on their analysis, paid campaigns by HelloSociety have achieved an average engagement rate that’s 95% higher year-on-year. For organic campaigns, their average engagement rate is 28% higher year on year. 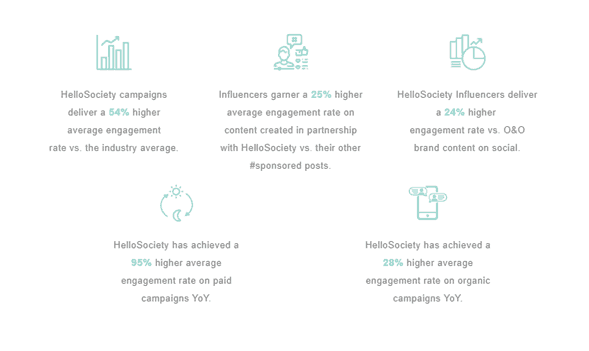 These numbers show how HelloSociety is among the best influencer marketing agencies in the world, especially as they focus on authentic storytelling. So it’s no surprise that their client list includes a host of top brands like American Express, Airbnb, Bosch, Coca Cola, Buick, Covergirl, and Chevrolet. Influencer Marketing Agency or IMA is one of the most prominent digital influencer marketing agencies. The conception of the agency began way back in 2010 when two of their founders created a fashion inspiration platform and eventually understood the power of digital influencers in growing the platform. So they started the full-service agency in 2013 and began helping brands leverage the same power that they had once benefited from. They have offices in New York and Amsterdam but they carry out influencer marketing campaigns on a global scale. IMA will shape an optimal strategy around your brand’s goals – taking charge of everything from creative concept to campaign tracking. The agency matches your brand with the most suitable niche influencers. They also help you discover long-term ambassadors who will match your brand’s voice. IMA has developed highly creative campaigns for prominent lifestyle brands like Nivea, Tommy Hilfiger, Under Armour, YSL, Diesel, Samsung, and Timex. They have even worked with organizations like UNICEF. TopRank Marketing is one of the few influencer marketing agencies that focus on B2B clients. As a full-service marketing agency, they also cover other aspects of marketing such as content marketing, design, conversion optimization, SEO, and social media marketing. Headed by B2B marketing leaders like Susan Misukani and Lee Odden, TopRank Marketing was established in 2001. The agency values real influence over massive social followings for B2B influencer marketing. They help companies build mutually beneficial relationships with industry leaders, subject matter experts, and rising stars. They develop always-on integrated programs that involve B2B influencer engagement and content development and amplification. One of their most notable partnerships is with Cherwell Software, which they helped drive engagement and brand awareness. The company experienced a 437% increase in content shares year on year. Their anchor asset pageviews was also 170% higher than their benchmark. Further, they experienced an influencer amplification rate of 100%. 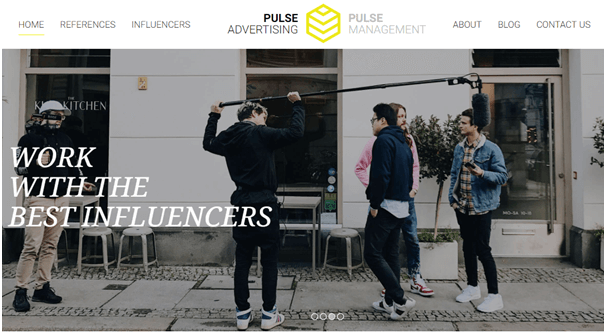 Pulse Advertising is one of the leading influencer marketing agencies in the world. The agency was founded in Hamburg, Germany in 2014 and has since expanded globally. They have offices in Milan, London, New York, and soon in Los Angeles too. Pulse even has dedicated satellite teams in other parts of the world including Spain, France, and the Asia Pacific so they can help brands engage a larger market. They pride themselves on their ability to take a holistic approach to influencer marketing. They tailor their processes to the unique objectives and expectations of each client. The agency helps brands activate the most relevant influencers for their campaigns. This comes easy to them as they have a powerful influencer network made up of 20,000+ influencers with a combined reach of over 1 billion. One of their most noteworthy campaigns was the Longines campaign to promote the brand’s new collection – the Master Collection Blue. With the help of just two influencers, the campaign saw more than 680,000 total interactions and an average engagement rate of 4.8%. Billion Dollar Boy is one of the most innovative influencer marketing agencies today. That’s because they don’t just provide influencer marketing services to brands. 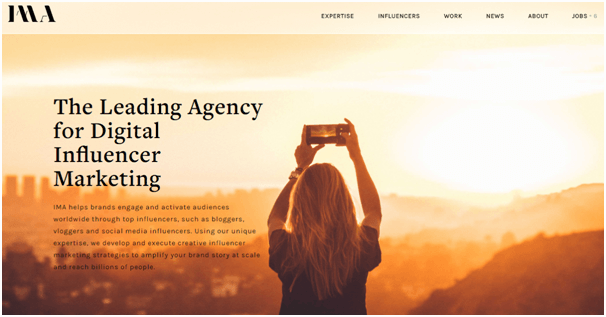 The agency has also developed highly useful influencer marketing tools that are accessible on request; not a lot of influencer marketing agencies offer this. MatchMaker is their influencer campaign management platform where you can manage every aspect of your campaign. The platform lets you pull up a long list of influencers relevant to your campaign and review influencer-generated content before submission. It also helps you find the best influencer market rates for your niche so you don’t end up overpaying. It even gives you a clear idea of where to spend your budget so your funds are evenly distributed at every stage of your campaign. Billion Dollar Boy also has a StoryTracker platform which, as the name suggests, lets you save and track the Instagram Stories of your influencers. This is an excellent way to track your campaign content and its performance in case your influencers are creating Stories for you. As one of the most prominent influencer marketing agencies, Billion Dollar Boy offers a host of services to brands. They help you execute campaigns that involve gifting, paid campaigns, affiliate marketing, events, and sponsored content. They further amplify your social presence through paid social boosting so you can get the most out of your campaigns. The agency also has an impressive client roster made up of prominent and upcoming brands alike. This includes brands like Primark, Garnier, Simba, and Zalando. INF is an agency that mainly deals in influencer talent management, although they work with brands and influencer marketing agencies as well. They help foster genuine and mutually valuable partnerships between brands and influencers. The agency will match your brand with an influencer that can reflect the core values and aesthetics of your brand. Their influencer network is mainly comprised of lifestyle and beauty influencers with significant reach. They also have a roster of influencers in travel, parenting, home, and wellness. Some of these influencers include Jamie Paige, Samantha Ravndahl, Xander Vintage, Kimberly Margarita, and more. The agency works to developing a partnership between these influencers and your brand for campaigns that involve product placement, content development, speaking engagements, and more. But they can also customize a campaign based on what you’re looking for and what you want to get out of it. Carusele is the sister company of Ignite Social Media, one of the leading social media agencies in the world. The agency was started in 2015 to cater to brands who want to get excellent content coupled with authentic and guaranteed reach. Within just two years of launching, the agency won a Shorty Award for the 2017 Small Agency of the Year. Their offices are located in Michigan and North Carolina. Ignite Social Media has been hand building their influencer network since 2008, even before their influencer marketing agency began. Carusele then adopted this network on more than 55,000 content producers who can help brands in developing premium content to fit their campaigns. It is one of the best influencer marketing agencies because it has its own set of tools and algorithms for more effective marketing campaigns. They have developed the TrueViews Algorithm and the Engaged Audience Profiles to help you understand just how many people your campaign is reaching. You’ll also be able to see whether you’re able to engage your exact target audience. Carusele also uses their Content Performance Index to track and score the content created by influencers for your campaign. This will help you identify the top-performing content, which you can further syndicate to reach high-value customers. Equipped with all these tools and functionalities, Carusele is one of the most comprehensive influencer marketing agencies. So it’s no surprise that they have plenty of leading brands in their client roster. They have partnered with Starbucks, Walgreens, Pepsi, IKEA, Hallmark, and Revlon. These are 10 of the best influencer marketing agencies in the world. Most of them are full-service agencies, which means they handle everything from campaign conception and execution to influencer recruitment and campaign tracking. Use this list to get an idea of which influencer marketing agencies might be best for your brand. Have you ever worked with an influencer marketing agency? Share your experience in the comments below.